Sometimes when I complain to much about living in the desert I have to slap myself and take good hard look around. I am very grateful that I am able to spend time outside for most of the year. 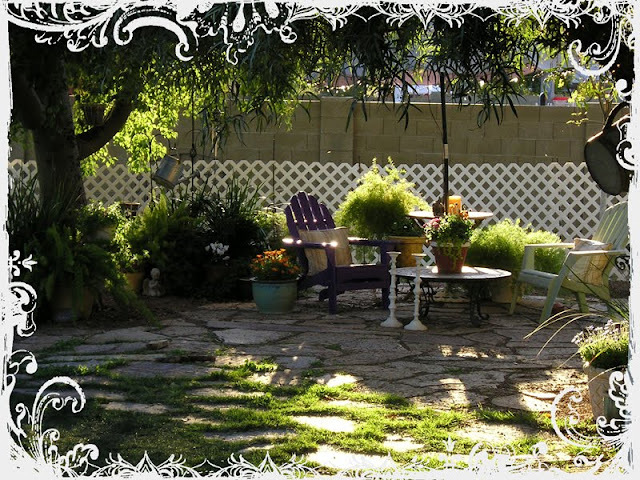 We are blessed to have a very large lot that allows both my husband and I to have the spaces we need to make us happy. My happy place in my backyard is in my garden. Well, I call it my garden. Really it's the back porch, the flagstone patio my husband and I built several summers ago by hand. (Yes, I said summer. What were we thinking???) 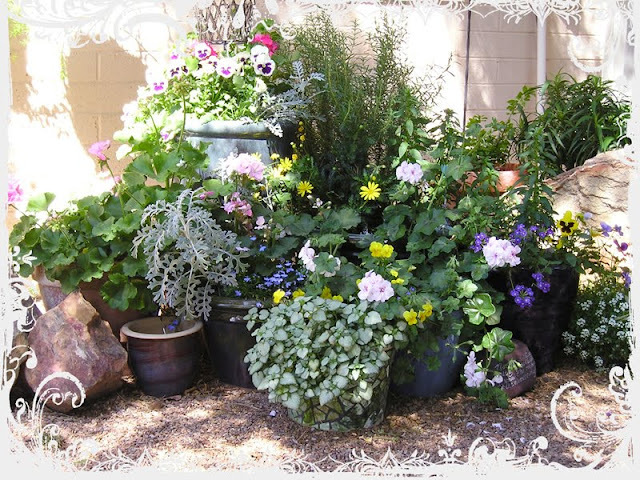 A large grassy lawn and tons of flowerpots holding a rotating variety of plants. When the weather is nice, I love to sit out on the porch with a good book and listen to my favorite music with the sound of my fountain in the background. A couple years ago when I was working a job that really stressed me out, sitting out there was the best therapy I could get at the end of the day. This is an old photo. I was in the middle of refinishing a pair of wooden Adirondack chairs when I took this picture, but wanted to show you how pretty the garden is in the late afternoon. On nice evenings my husband and I like to sit outside here together. We listen to music and talk about our day, or better yet, talk about our dreams for the future. On cooler evenings the mosaic table top that I made gets put away and a firepit takes it's place. A mug of hot coco and an afghan and I am a happy camper! It's a lot of work to keep the garden looking it's best. Some years are better than others, but it's definitely a labor of love. I hate our Winters here, but mainly for the snow. I actually have always liked having Winter as a break from having to work in my garden. It also allows me to look outside and see what might look nice where, so when Spring comes I can try some new or different flowers. I've been doing pots a lot more in recent years. Hi Karen, Just wanted to say How Beautiful your pictures are, I so Love your home. and so enjoy just looking at your blog and all the beautiful things you have made and collected..
Karen, you have such a lovely beautiful home. Every room is just so warm and welcoming. Next time I'm in Arizona I am going to come over and we are going to make cookies and eat them! haha. No seriously, your home is so cozy and beautiful and it feels like a home where you could just walk in, curl up and eat cookies. Love it. I need you here at my back yard. It has really taking a beating with the horrible heat last summer and the cold this winter. Next week we plan to replace some bushes. I love when it is so pretty and I can enjoy it...but with my health condition, I can't do as much as I would like. Your backyard is lovely!! Hope you are enjoying it on our non rain days this month!! Hi Karen, oh boy have I enjoyed seeing all the things in your life that give you joy. I loved the post about your dogs so much. This one about the garden is wonderful and I can definitely see how this lovely oasis would bring you happiness. It's all just so pretty. I really enjoyed the pictures of your garden. Thanks so much for posting them. I am so looking forward to spring! I've been talking to my husband about really working on our backyard this spring. I too love sitting outside and looking at all the beautiful plants... very relaxing. Your garden really is very pretty. So much greenery, it's refreshing here in the southwest. And with the rain we are getting now, the spring will be a sight to behold! I am gleaning ideas from your garden for use in our backyard. It has a long way to go since we have just been here a year and a half. Hi Karen, Sounds like heaven to me. Warm weather is for me. It'snice to meet you I'll stop by again. 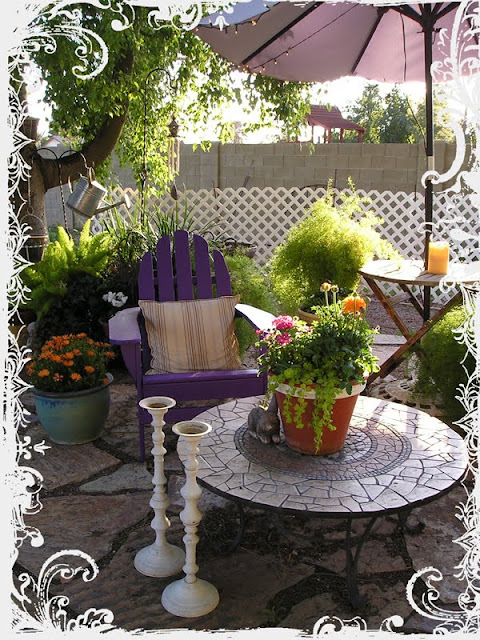 I would love to be able to sit out on your patio in the evenings and enjoy the surroundings. So lovely, peaceful and calming. I can see why it makes you happy! What a beautiful place to relax and enjoy the day! What a wonderful retreat....haven't been by in a while and enjoyed your backyard ever so much.....beautiful! What a beautiful place that you have created! Your pictures make me dream for spring and summer here. What a great looking backyard! I can see why you love spending time out there. Karen, I can't believe you live in Arizona. It is so lush and green and cool looking. This winter I moved my fountain into the living room to help hydrate my plants-It reminds me of balmy summer nights on the screenporch. Beautiful pictures! Karen, your garden is beautiful!!! 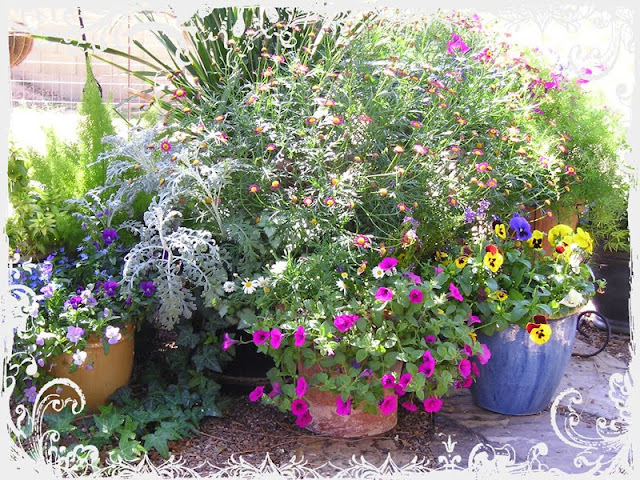 I only wish we had a long enough season to grow a garden, love the flowers and all of the wonderful plants you have. You have a definite style, just love it all!! The outside of your home is just as beautiful as the inside! Very nice Karen!! How lucky you are. Thanks for your very sweet comments. Your house is beautiful love all the pictures of it in the side bar! I love your backyard what a retreat you have back there! That is for sure a lot of work to keep up with all of it, but I know you probably get every minute of that back and more in enjoyment of it! You have a wonderful blog look forward to coming back soon and reading more! You know how much I love your garden! Every time I see it, I want to run outside and work in the yard, just like it makes me want to do today, even though it's raining cats and dogs once again! I can see why you love to spend time out there. Soon as it dries out here, I will be back to look again for inspiration. 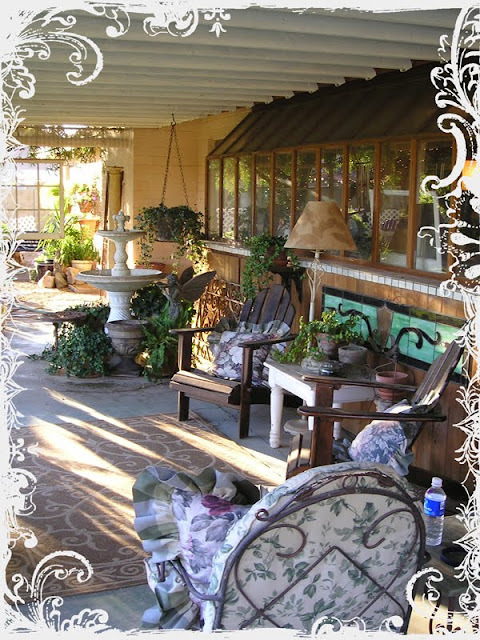 Your garden area is just beautiful..reminds of the yard I had in San Diego many moons ago....it was wonderful having a year around growing season. I haven't been by in a while...time just seems to go by so fast at times...Glad to see you are doing well. Oh man, your porch makes me die for spring!! Yes! You should be so happy to be able to be outdoors year round! 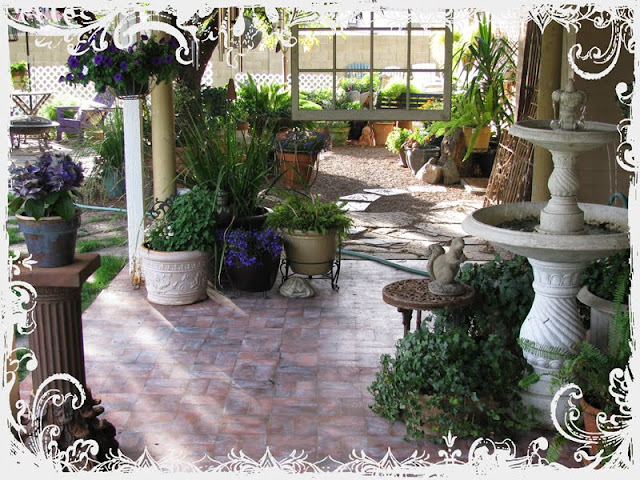 What a beautiful garden, and I love how you decorate your gorgeous photographs with lovely frames. A girl after my own heart obviously!! This is a really fantastic outside space, what a lovely place to be able to sit and .....do nothing? WOW! I could sit out there all day long! Absolutely beautiful! I just love your garden photos. Actually, I just love all the photos I've seen so far on your Blog. You have a fantastic eye and are incredibly gifted. Thank you for all the inspiration. I just moved to Tucson back in December and I was wondering what grows best here in the desert? As far as flowers. I had wisteria in my old garden and loved it. What months is it best to start planting?